The walnut may have a hard, tough shell on the outside, but the meat on the inside--which kind of looks like a tiny brain--is rich and sweet tasting, and the edible, papery skin adds a nice touch of bitterness. The walnut is the most widely-consumed nut in the world and has been around for more than eight thousand years. The walnuts we find readily available are English walnuts and Black walnuts, with English being the most familiar. The English walnut (which actually started out as the Persian walnut) has also been named California or Mission walnuts. Don't confuse this with the California Black walnut, which is a type of Black walnut native to America, most commonly referred to as simply a Black walnut. This variety has a bold, earthy flavor and a thick shell that may stain your hands. The English walnut, on the other hand, has a more mild taste and a thinner shell that is easier to crack. Walnuts are sold in their shells and out of their shells. Walnuts in their shell range in sizes from jumbo to baby; shelled walnuts are offered halved, chopped, diced, sliced, chips and ground. If buying shelled, prepare for a higher price tag--these nuts are hard to crack, and the percentage of whole nut pieces is low. Avoid rubbery or shriveled nuts as this is an indication of age. Reject any walnut pieces that are cracked, pierced or stained as these are signs of mold, which is not safe to eat. Shelled nuts should be brittle and snap easily. Those nuts which grow on the sunnier side of the tree will have a darker skin and a richer flavor. Warning: some commercially-packaged nuts are often treated with ethylene gas, fumigated with methyl bromide, dipped in hot lye or a solution of glycerine and sodium carbonate to loosen their skins, and then rinsed in citric acid. If you can, avoid commercially-packaged walnuts. 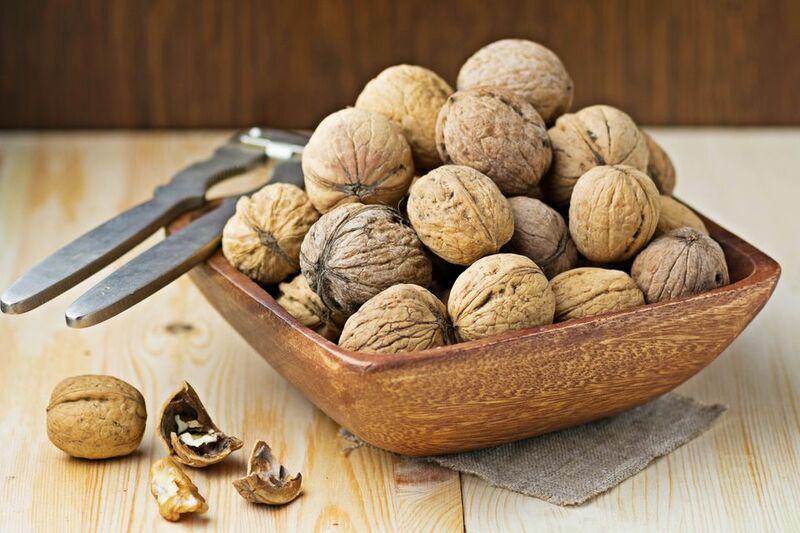 Due to their high oil content, walnuts can quickly turn rancid if not stored properly. For long-term storage, it is best to buy unshelled nuts and place them in the refrigerator for two to three months or freeze up to one year. If using in a short time period you can keep in the pantry. Shelled walnuts should be kept refrigerated in an airtight container, lasting up to six months, and may be frozen up to a year. One pound of walnuts will yield about 2 cups of nutmeat. Walnut oil is an excellent, albeit expensive choice for salad dressings, but not for high heat uses.